In which the combination of sunshine, heat and altitude catches up with the mooses, who, soaked and panting, find themselves easily passed on their way to the Boynton Canyon Vortex by old, chubby folks out for a simple stroll. After a wonderful night’s sleep at the Desert Quail, Rich and I hit the road relatively early. Our intention was to find the Oaxaca Restaurant and indulge in some breakfast before our big vortex hike. Since yesterday afternoon, we’d had our eye on the Eggs Oaxaca mentioned in the brochure. Who could turn down a shredded beef omelet with green chili sauce and cheese? I sure couldn’t, its questionable authenticity aside. Unexpectedly Rich pulled off Route 179 into a small parking area just in front of one of the large red rock formations I’d noticed on our way into Oak Creek. Without requiring too much imagination, this formation takes the shape of a bell; good thing it’s the one called “Bell Rock.” Behind it (to the east) is the grand formation known as Courthouse Butte, with its columns and crevices. Too quick a glance at the map on the trailhead kiosk gave us the confidence to poke around on the trail encircling the rocks before breakfast. Why not? How far could it be? The hour was early, the air was still cool and the sun was low. 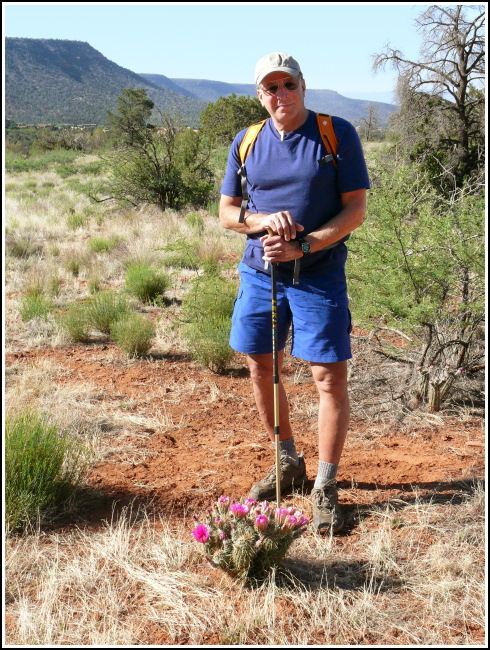 The cool air and shade lasted long enough for Rich to snap a few shots of me climbing around the base of Bell Rock and posing with the prickly pears. Once we were again out in the open, on the dusty rust-colored trail, I started to worry about having left the sunscreen in the car. Zhanna is ready for a "short hike" around Bell Rock. 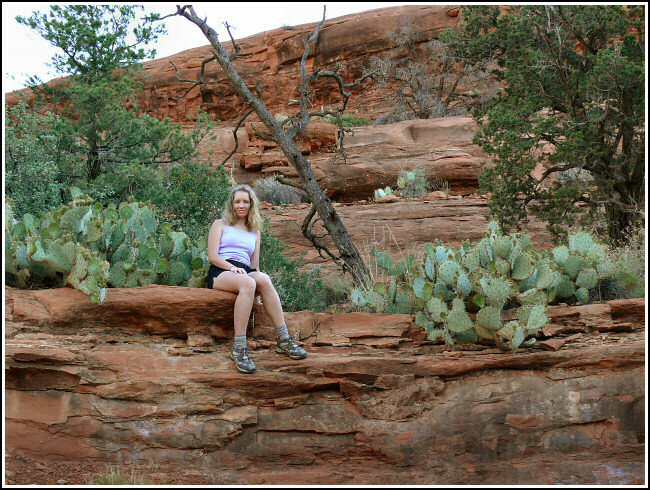 Zhanna finds a cool seat among the prickly pears. At least we can still see his ears and his white tail! “We’re gonna sizzle like sausages,” Rich had said over and over again on our way into the Phoenix airport, with a grin each time. Well, we were sizzling like sausages. But this was such a lovely area, we couldn’t force ourselves to turn back! I was fascinated by the changing colors of the rocks, which appeared to shift by the minute as both we and the sun altered angles. Lizards skittered across the trail inches in front of my feet, pausing only long enough to make sure I’d noticed them, and then dipping back into the shade before I could take a photo. 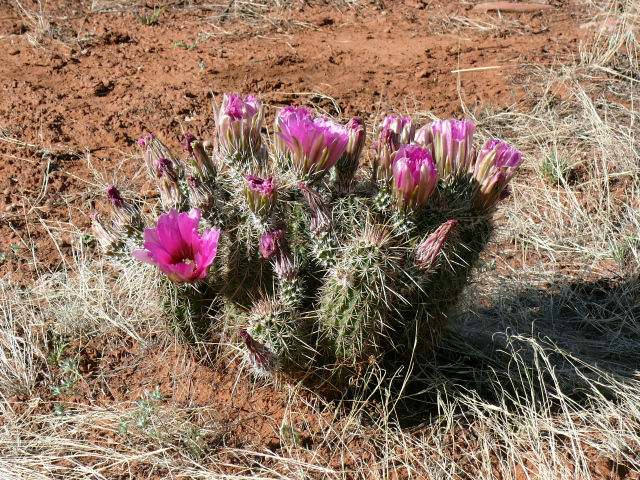 After just a few hours in their country I had fallen in love with cacti, and as we walked and chatted quietly I searched for any sign of their colorful blooms. 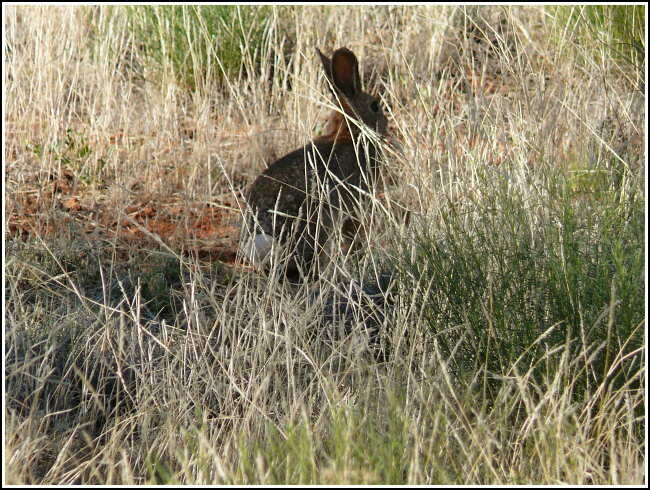 Jackrabbits out for a morning munch caught our eye, but this one turned to leap away as soon as I got close enough to attempt a snapshot. 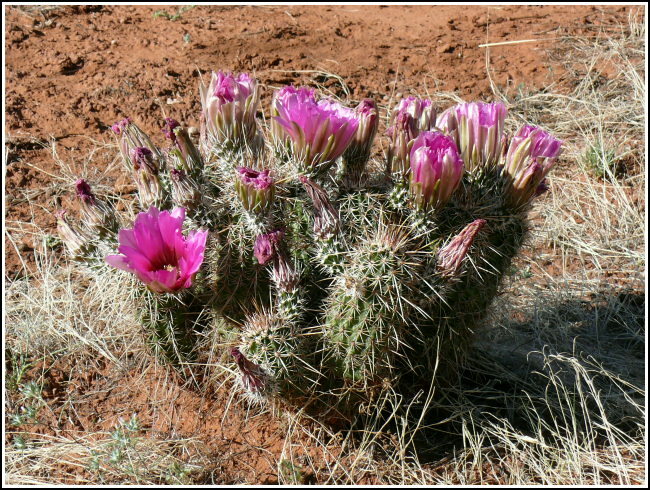 I loved the bright fuchsia flowers of this hedgehog cacticus. The human animals were out early too, of course. A group of hikers passed us, and mentioned having hiked in the Grand Canyon the week before. Eventually, just as we had decided to try the entire loop around Courthouse Butte, a mountain biker came up the trail toward us. We both watched in envy, and Rich quickly asked how many miles were left. “You’re not even halfway!” the biker told us. He described an alternate route back to the parking area using the nearby Big Park Path, but being so unfamiliar with the area, we decided to simply retrace our steps. We have already vowed to rent mountain bikes next visit, and complete this loop as well as other trails in the area! Rich looks very relaxed and at home here in the desert. Oaxaca Restaurant was our scene for breakfast (well, brunch) that day. After some confusion we finally located the restaurant right in the middle of the most touristy section of town. (We deftly avoided the Cowboy Club and the Pink Jeep Tours nearby, I’m sure much to the chagrin of Rachael Ray’s followers.) A glass of pineapple juice, drunk down in a flash, accompanied my Eggs Oaxaca, as planned. Rich enjoyed his spicy Huevos Rancheros, and helped me a little with my eggs. The place was comfortable and nearly deserted, service was fair, and the view was incomparable! Large arched picture windows gave us a nearly unadulterated view of some of the most inspiring formations, which glowed crimson in that particular lighting. While we ate, Rich even spotted a Pink Jeep bouncing its way along among the boulders. While we ate, Rich also mentioned that we should be able to buy a Red Rock Pass (required for parking at Red Rock Wilderness areas) at the Forest Service visitor center across the street. And so began our expedition into Boynton Canyon! 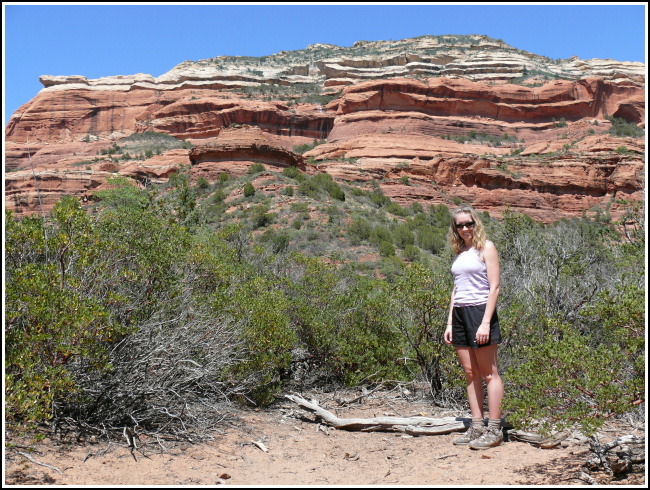 The hike to the Boynton Canyon Vortex was hike #1 in our “50 Hikes in Arizona” volume, and though we had no intention of knocking them off the list one at at time, it seemed a fitting first trek for this vacation. 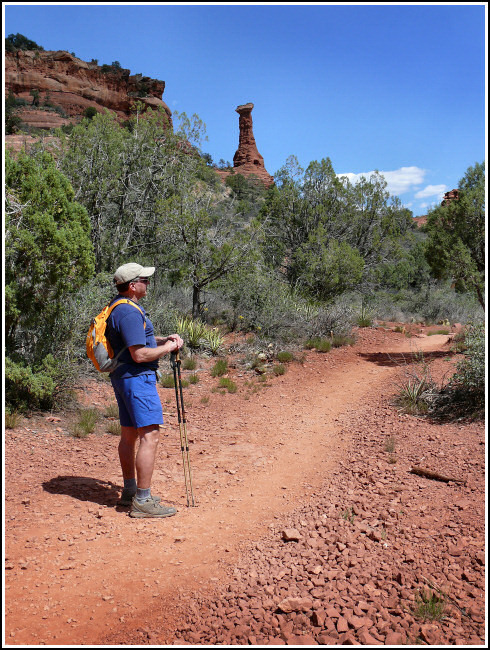 Described as a well-maintained path with some shade, only five miles round trip, and culminating in a steep rock scramble and spectacular views back over the canyon from the vortex point, we knew this trail would be enchanting, if rather easy. Perhaps we should have scaled back the hubris. While the trail and canyon were indeed magically beautiful, we were suffering by mile two. Adding insult to our injuries (well, our cramps and lead-legs and pounding hearts) were the elderly hikers, out for a simple morning stroll, fully decked out in long pants and long sleeves, carrying perhaps one 12-oz bottle of water for every pair. They lapped us. They were not the only ones. Chubby girls with, again, barely a bottle of water between them, chatting as they practically skipped along. Men in jeans and denim jackets (I nearly fainted just looking at them) passed by with heads dry. Putting aside our lack of conditioning, both Rich and I were fascinated by the hike. I love the slow pace we’ve begun to take on most of our hikes, even when we’re not frying in the sun. 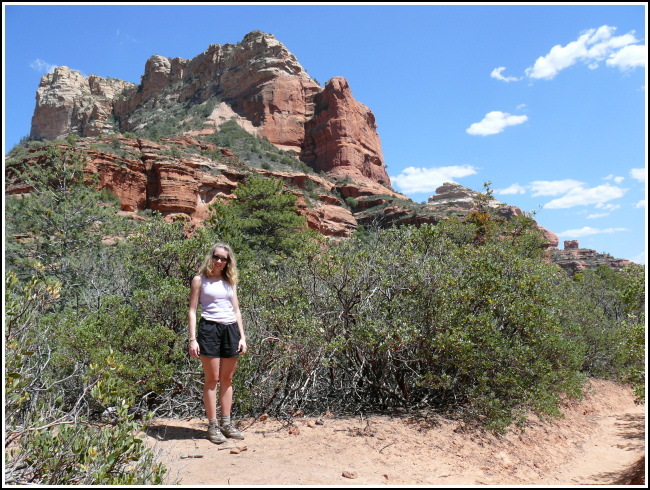 We love to wonder—and eventually learn—about the geology of each new area we visit, and Sedona was paradise for us in this respect, too. 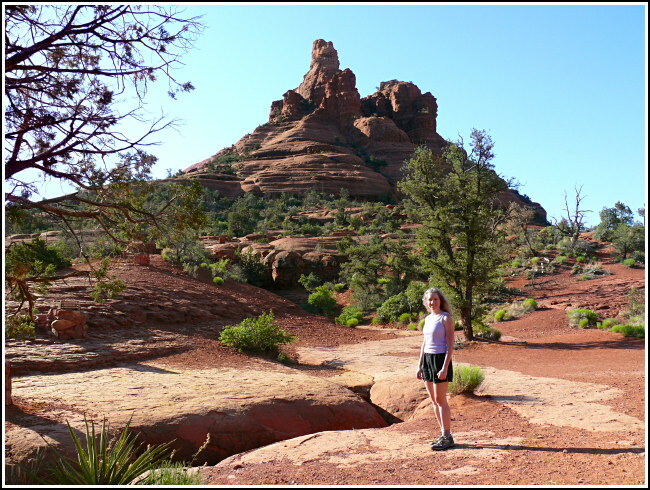 We stopped often to comment on the spires, the columns, and the sheer vertical sculpted layers of red sandstone frosted with pale grey limestone guarding the path. Though the shade didn’t often occur when and where we needed it, we enjoyed each break from the sun as much as we enjoyed the sunshine itself. I even had a chance to scribble a bit in my notebook, squatting under a pine, while Rich took a bathroom break. Salmon, tangerine, rust … the colors of sunset, baked into stone, surrounded us at noontime. Rich pauses along the trail to take in all the colorful beauty. There must be a vortex around here somewhere! Zhanna is in awe of the crimson cliffs. To our disappointment, though we felt a serious lack of energy and hydration, despite the liters of water and Gatorade we’d gulped down, before we reached the rock scramble. We sat on one of two level boulders in a darkened grove along a forested stretch of the trail. We rested. And we sat and sighed and sweated and drank some more, and watched the desert dwellers wander on by with ease. Neither of us willing to suffer heat-related illnesses as we had in the past, we decided we’d had enough of a warm up for our first day and, with great reluctance, turned back. Five days’ puking didn’t sound like fun to me, and having Rich’s knees ruined our first day out was also a unwelcome outcome. Our return along the open, sandy section didn’t seem as scorching as on our first pass. As before, we skirted the “Enchantment Resort” and noted its outbuildings’ meager attempt to blend in with the redness and asymmetry of the surrounding rock. We also noticed that we were “on camera” and had better not try any funny stuff, such as attempting to scale the barbed wire and sneak onto the resort. Don’t worry, I’d much rather be on the trail. 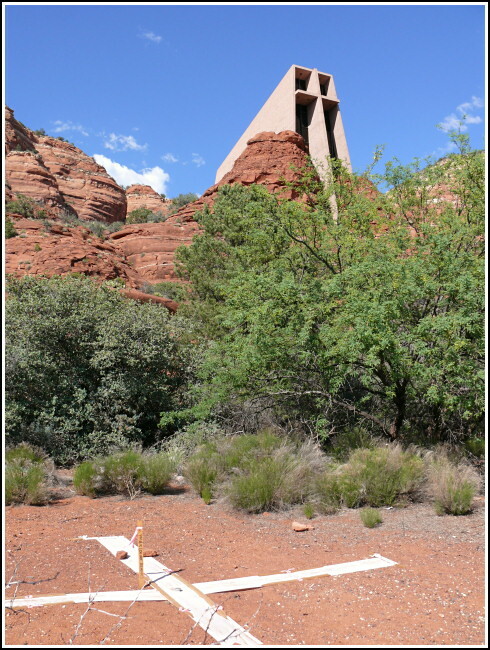 The day was still young, so we took a quick drive to see the Chapel of the Holy Cross, a fifty year old, 200 foot tall structure set right in between two massive red rock formations. It gives the impression of having grown right out of the rocks. Designed by a student of Frank Lloyd Wright, I’m sure the interior is unique and interesting as well. The place looked like an anthill crawling with visitors when we arrived, though, so we only viewed the church from the outside. How fortunate, also, that I spotted a survey disk in a small clearing below the chapel! Rich pulled onto the shoulder and waited in the car while I examined the mark and took some photos. This lowly survey disk surely has some of the best imaginable surroundings! For supper we had planned on El Rincon, the only establishment in the neat arts and crafts village of Tlaquepaque that remains open past 5:00pm. Though we had only a two-minute wait to be seated, the place was bustling within the half-hour. We sat outside on the patio with an umbrella spread wide over us. The scene had the pleasant atmosphere of a neighborhood barbeque, with plenty of eavesdroppable conversation to pique the curiosity, but which was easy enough to tune in and out at will. There was a young professional boasting about his clients to an older man and a young mother, who was nodding while clearly distracted by her fussing little girl. There was a transvestite in Lycra and silver, with manly hands, commenting once in a while to the made-up, bored-looking blonde next to her. They left their doggie-bag on the table. Our food was traditional Mexican-style, and delicious. I love the crunch of fried corn tortillas, so chicken flautas and beef and bean tostadas are some of my favorites. Rich ordered a beef burrito, and found a combination of some of our favorite ingredients in a shrimp and green chili enchilada, which we shared. I experienced that familiar warmth in my belly from the food, beer, and our conversation. I couldn’t possibly be in a better place, at a better time, with a better partner. Though Tlaquepaque was shut down for the night, nevertheless we wandered along its stone balconies and courtyards, past the wire burro, beneath the giant sycamores (“your sycamores,” Rich would say to me every time we saw them in future days). We then retired to our moose-cave-away-from-home and after some quiet time together reading over maps and guidebooks, turned off the lights. 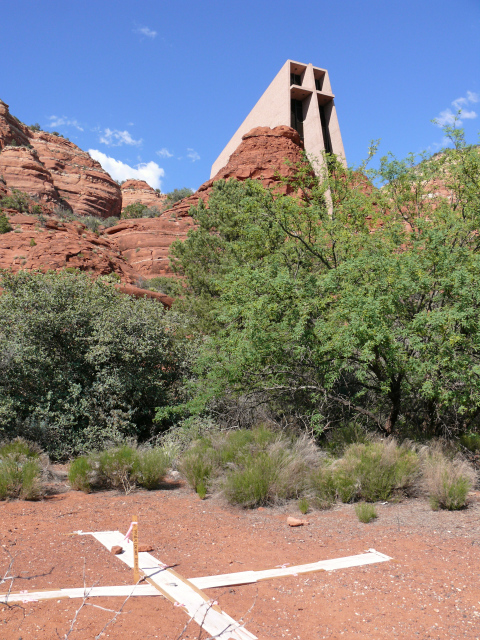 Next visit, for sure, we will rent mountain bikes and ride the entire loop around Bell Rock and Courthouse Butte! It’s all Rich has talked about. I’m certain that we had trouble in Boynton Canyon only because, at the time, I lacked a Vortex Hat (which shall be defined later). With that deficiency now accounted for, we will return and will reach the ever-sacred vortex next time. But though we had to leave our goals unreached, I have no sense of failure. I never considered it. Every outing with Rich is a success, a learning experience that satisfies to some degree while inspiring me to see and learn more. My senses are constantly challenged and indulged. He sees beauty and interest, as I do, in the details of the intimate and the vast. He can sit in one place for hours and just look.